A report from Environmental Justice Australia has detailed six ways in which coal companies can sidestep their obligations for mine rehabilitation. 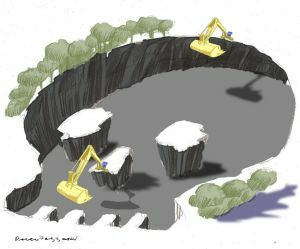 Besides just petitioning the state government for permission to leave a big hole, perhaps planting a few trees around it, these include selling the mine to a small company, putting the mine on “care and maintenance”, keep running the mine at a loss, expand the mine or apply to the government for a rehabilitation discount. While Indian conglomerate Adani and the Queensland government appear, peculiarly, to be pressing ahead with the world’s biggest new coal mine, plunging demand for the black stuff, particularly thermal coal which is used in electricity generation, has meant plunging coal prices and few if any mines in Australia are now operating profitably. The outlook therefore is for a rash of mine closures for which rehabilitation costs are likely to run to tens of billions of dollars. At least three NGOs are now preparing reports on various aspects of rehabilitation. As many companies appear under-funded to meet their obligations, and as there is a clear conflict between fulfilling one’s “social licence” by cleaning up properly and keeping costs low for shareholders, it is destined to become a significant public issue. 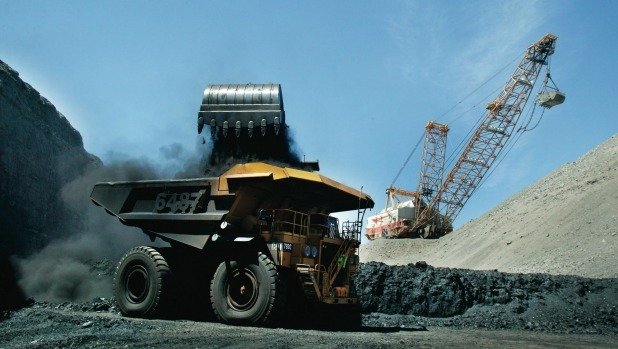 The report mentions as an example the fire sale by Sumitomo Corporation of 50 per cent of the Isaac Plains mine in Queensland for $1 to Stanwell Coal in 2015. Sumitomo had only acquired the stake for $430 million two years earlier. Then there was Anglo American which sold its Dartbrook mine in December for $25 million to Australian Pacific Coal, a small company on the ASX. Dartbrook’s market value was just $13 million. It was then controlled by Nathan Tinkler, who has since become bankrupt. Dartbrook’s mine had been on “care and maintenance” for some time. It had not been rehabilitated. This is the equivalent of putting a mine on mothballs. The operation is neither producing, nor is it closed down, but is ostensibly kept on ice until coal prices run higher. This is a decision of the company and can last indefinitely. The EJA report notes that, as of July 2013, some 104 mines were in care and maintenance in Queensland. “In contrast, approximately 60 large-scale coal mines were in operation and between 15,000 and 17,000 mines of all types had been abandoned”. While a mine is still operating, management always holds out hope that the commodity price will rebound. Although most analysts now agree coal, particularly thermal coal, is in structural decline, most mines in Australia are now operating at a loss. “Instead of ceasing operations, getting a start on rehabilitation and paying out workers’ entitlements, there is a financial advantage to the company to keep operating the mine until cash reserves run out,” says the report. The cost of rehabilitating one single “void” at Rio Tinto’s Mount Thorleymine in NSW was estimated at $2 billion. It was so high that the government of NSW government deemed, “it would not be reasonable to impose a condition that requires Rio Tinto to completely or even partially backfill the final void”. The void was four times the size of Sydney’s Centennial Park. Rio says the void was intended in the original mine design and, in any case, “It will be largely hidden from view due to the surrounding landscape and extensive rehabilitation works planned after mining”. Provisioning for rehabilitation can be delayed by expanding. The EJA cites the example of Anglo’s Drayton mine in NSW. Authorities rejected the expansion and Anglo had to set aside $US224 million in its accounts for mine closure and rehab. For mining companies the attraction of expansion is not crystallising a loss on balance sheet. Discounts of up to 30 per cent for financial assurance are available from the Queensland government. Even companies on the edge of bankruptcy, such as US coal giant Peabody Energy Inc, are applying. Peabody has applied for just such a discount on its Millennium mine on, ironically, grounds of financial stability. Meanwhile, Peabody is flirting with Chapter 11 bankruptcy in the US and its financial statement show its Australian entity is only a going concern while the guarantee of its parent exists. Despite the financial peril, the accounts of Peabody Australia Holdco show, despite its rehabilitation obligations, it paid a $63 million dividend in 2014 despite negative shareholders funds of $3.8 billion. Net debt at December 2014 (its 2015 accounts are due in a few weeks) was $5 billion. The interest expense paid to external parties in 2014 however was just $4.9 million, which suggests Peabody in the US (or its offshore subsidiaries) has supplied almost all the debt of Peabody Australia. Also trade and other payables of $3.79 billion (versus trade receivables of $300 million), which implies credit has been extended for more than a year’s revenue (2014 at $2.96 billion). This trade payables is totally out of kilter with normal business needs and in the absence of a note to explain this, it indicates the financial leverage is far higher that the $5 billion net debt figure. Auditor E&Y was paid $2.1 million in 2014 for the audit alone. E&Y has noted the business’ status as a going concern is reliant on parent support. Peabody’s financial assurance is $US299 million, which would seem low relative to the size and the long history of the group’s Australian operations.